It pains me to have to write this, to keep having to write these posts about what everyone should know are just horrible, horrible ideas. There is a new draft of the regulations out, this time put out by the Ministry of Fisheries and since they have pretty much had a monopoly on the worst ideas, you can imagine where this is going. This does not ban DIY, so if that’s all you care about, you are in the clear… kind of. However, if you mis-calculate and end up committing an “offense,” well, the fine is up to $5,000 with the added possibility of three months in Bahamian jail. Doesn’t that feel welcoming? You can still rent a boat to go fish, as long as you are the only one on it. A boat with two people required a guide, or, $5,000 and 3 months in jail. Native Bahamians are required to buy a license to fish the waters right in front of their own homes. To make matters worse, the proposed regs enshrine the place of power of the Bahamas Fly Fishing Industry Association, run by Prescott, who should be disqualified from being 100 feet from anything involving fly fishing based on how poorly he’s handled this whole thing. I’m hearing stories of independent guides really hurting as anglers just go other places. This isn’t going to help. This is the dumbest bunch of regulations in one place, at one time, in the modern history of the Bahamas. I cannot imagine that the average Bahamian has any idea of the power play going on here, or how their lives and businesses would be impacted by this. The place I visited on Abaco earlier this year would be pretty much shut down and that family would lose at least 50% of the income they get from tourists, if not more. I bet they haven’t been consulted here. They would be blind-sided. You can’t promote your industry by threatening your primary customers with three months in jail. Who does that? I’m not sure who you can write or complain to at this point. I’d urge you to maybe give a call to your Bahamian friends, the places you stay, the business you frequent, and tell them that something evil this way comes and the hurt is only just beginning. views and/or comments (if any). This entry was posted on Friday, April 22nd, 2016 at 7:37 am	and is filed under Locations. You can follow any comments to this entry through the RSS 2.0 feed. You can leave a comment, or trackback from your own site. So this means I cannot rent a boat from my Bahamian friend on Harbour Island to take my daughter across the bay so that we might fish together. And that I am in contravention of the regulation if my wife or a friend joins us. And that at minimum my kid would have to have a daily tag. And perhaps, if we were to wade a bit and I said to the kid that she should fish “over there” I would be deemed to be guiding. Even if we fished the flat at Dunmore and never got in a boat. Poorly conceived and written all the way round, but better than what we were threatened with last year. Why should a bahamian not pay a simple $110 a year to fish if the money goes to the conservation of our flats . Do you not need a fishing license to fish in some states why we in the bahamas have to be different. Some of those Bahamians don’t make $110 dollars a month and live off the fish they catch. Would you be willing to pay 1/12 of your income to fish? Why should a Bahamian pay $110 annual to fish and would he need a “flats license” what ever the hell that is? If a Bahamian w/o “flats” permit is hand line fishing snapper for sustenance in water less than six feet deep, does he get to visit jail? Does a tourist go to jail? and who decides if their flats fishing ? Bahamas “flats permit” whatever that is? I can fish my state’s saltwater and any Federal waters in boating range and keep any legal allowed catch for $ 17.50 per year . 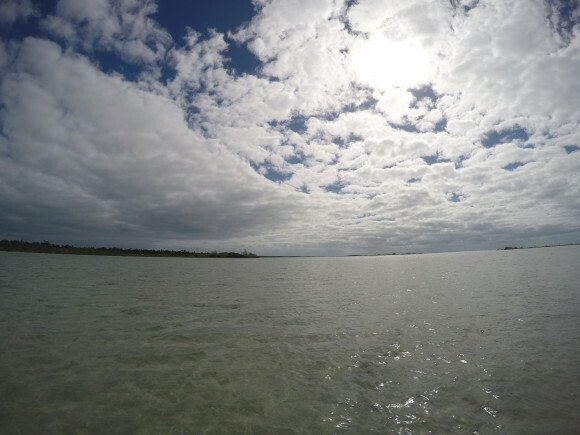 If a reasonably sane fishing bill had been suddenly passed in the Bahamas and it pertained to fishing in general and not “flats specific” and not designed by a self serving individual, the added cost wouldn’t seem so bad….. I agree with Glenn. While this draft is better than last year’s, the cost of a license is not in line with other destinations at all. Why not just propose a *reasonable* license fee? I routinely buy annual licenses for three states I regularly fish, and the combined cost of those is not even half of what the Bahamas is now proposing. And if you book a house rental that comes with a small motorboat, how do these draft rules apply? My wife and I have been going to the Bahamas every winter for the past few years. We relax, explore, and do some flats fishing. There are so many places to fish in the world that I’ll never see, even if I had another lifetime. If these regulations are passed we will definitely be rethinking our plans. I think the worst part for me is the ambiguity. I do DIY (mostly on E but was planning a trip to Cat) and I mostly bonefish but I also do blind casting. How is this covered? Definitely will look somewhere else. There should be a link to it in the post. Interestingly, according to the proposed regulations and the definitions therein, I don’t need a license to fish for barracuda, mutton snapper, yellow tail snapper, ocean going triggerfish, or any type of fish on the flats other than permit, tarpon, snook and bonefish. That seems a little narrow-minded in my opinion. Personally, were I a Bahamian outfitter or guide, I would strongly object to any amount of the license fees being directed to the Consolidated Fund. Those licenses are mandated for a very specific purpose and all monetary proceeds from those licenses should be directed to preserve and protect the specific fishery involved. There are plenty of other ancillary monetary benefits associated with visiting anglers that can be directed to the Consolidated Fund. It makes perfect sense to do so – for example, taxes on hotels and food and travel can and should be used to maintain and improve roads, traffic, lighting, infrastructure, etc. But 100% of the fishing license proceeds should be directed to protect and preserve the fisheries. I would also stipulate that at least half of any fines collected as a result of these proposed regulations be directed to funding the enforcement and protection of the fishery and associated regulations. It’s one thing to mandate regulations requiring licenses, and permits and permitted guides, etc. but unless one provides for the enforcement, those regulations lose all credibility. It will not be cheap to provide fishery inspectors on every island and equip them with training, uniforms, vehicles, boats, fuel, etc. But without them, any proposed regulations aren’t worth the ink they’re printed with. Lastly, the proposed regulations provide no grandfathering clause for existing guides. If I were a flats guide in the Bahamas, I would be more than a little upset that I would now have to go to the Bahamian Fly Fishing Industry Association, attend some undetermined training or testing, and then pay $100 every year to continue guiding. Furthermore, the proposed regulations do not state where those funds are going. One would expect and hope those funds are directed back to activities that support and protect the guides and the fishery that provides their livelihood. Most of the guides I know and have used in the Bahamas are some of the most competent, conservation minded guides any where in the world and they need no training or testing from some self-aggrandizing association to be deemed “flats fishing guides”. Nor should they have to pay $100 annually for that right. Change is never positive for all. It will be difficult to create the perfect playing field based on everyone’s wants. An internal need has arisen to protect the rights of the citizenry of The Bahamas – and that should be respected. When The US(N)A decided that their borders needed to be protected, it demanded that visitors apply for and receive a visa just to visit. That costs me $135. I complied. Paying that fee is no guarantee that i will even get the visa. It (visa) assures me no right except to step foot on soil. If I contravene that requirement, the penalties are stiff and life long. The United States of North America sees the value of its land and the resources it holds. Same here. The waters of The Bahamas holds tremendous resources and the citizenry is seeking to have its Government ensure it remains sole property of this sovereign country. As unfair as it may seem… I am obligated to ensure my grand children inherit something that was given to me by my forefathers. Visit. Enjoy but please… Do not criticise me for wanting to reserve the Bahamas for Bahamians. I’m going to go ahead and criticize you. Your arguments don’t begin to hold water and you may want to think about weathering the coming economic storm in so flimsy a craft. There is nothing being proposed that will ensure your grandchildren will inherit the flats. In fact, I’d suggest the opposite. By limiting, dramatically, the number of anglers visiting, you also dramatically limit the number of people who will care about a resort development or mine or whatever the next catastrophe might be. You will also reduce the number of people who can make a living from tourists, meaning they’ll need to turn to more exploitative means of making a living, like those mines or resorts that rip up the mangroves and scoop up the sands. You can’t berate and scold your customers, which is what this is doing. I hear frequently from people who have been vacationing in the Bahamas for years and who won’t go back. You have a tourism-based economy. Alienating the tourists is not smart. Someone has convinced you this is a good idea, but they are wrong. You won’t get security or wealth or sustainability. You’ll get ruin and you seem to be signing up for it. You see a friend waving frantically as you head toward the cliff, you should maybe listen to the friend instead of plugging your ears and insisting you have a right to drive any damn direction you want. You make it sound like the fishing communities of the world want to send factory trawler ships to plunder the Bahamas fishing resources? Your forefathers had little to do with the abundance of flats fish, that was God given, in fact your forefathers likely netted and consumed them as some of their descendants still do today. The rhetoric you base your argument sounds very familiar and although the rest of the world seems to disagree for all the logical reasons stated, it continues. If you want a select few to control and monopolize a sustainable fishery at the harm to many others then perhaps you are of that select few? If a resemblance of the latest draft is passed w/0 major revisions, I’ll be another of those persons not returning. There are plenty of beautiful places in the World to flats fish and feel welcomed. What I find funny is the BFFIA wants to be part of the “policing” in all of this. Which you and I know means they will chase and harass any visiting angler that appears to be fishing on their own, even legally, until the BFFIA gets what they want: them to literally leave the water and never return again so that BFFIA and their members have a monopoly on everything. Last I knew, 100% of 0 is still zero. This whole thing isn’t going to end well. Hopefully the only people who get hurt by it are the select few trying to push it, and not the vast majority of uninformed Bahamians that only see the nationalistic propaganda machine that is the BFFIA at work. Thanks Glenn Forbes. Your response is testament to your acknowledgement of the value of the resources of the Bahamas. You must be a prophet. Daily Dominicans poach in our waters using trawlers. Several years ago Koreans were here with trawlers. Hatians…Jamaicans… Now Chinese… All trawling. There is more than enough resources to share but there is process. There are laws. Follow the law and respect sovereignty. I am not a commercial fisherman nor a professional fly fish guide… I am a citizen that is interested in the growth development and sustainability of my country. Bahamians first in my view. I prefer a Bahamian benefit over anyone else in the world if there is a choice. The world is invited to come and enjoy this country… But I live here and I am mandated to ensure it remains here for the benefit of my children and their children. Simply put my wife and I go to the Bahamas every winter for a week or so, she reads and I fish – always catch and careful release. Last year it was Long Island, during a time of low travelers as the island recovered from the hurricane. The consequence or mere possiblity of being hassled or worse for wading a flat is too much for me to risk to re-visit the Bahamas. Frankly the whole thing is in the “hard to believe” colum. Count me wading somewhere else. Thumbs down!! 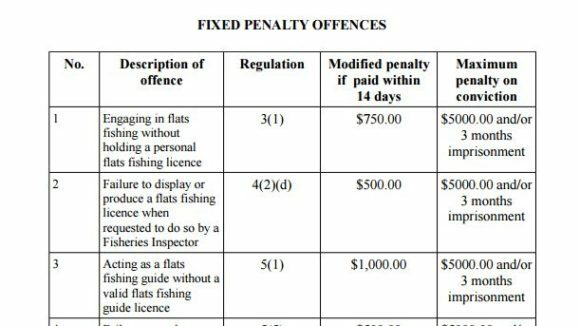 Note that the penalty for fishing without a license in Canada is $2,000. Also note that the daily license fee for non-Canadians is $20 per day, $80 per year. Additional daily fees for steelhead fishing in September and October in British Columbia for non-British Columbia residents is $20.00 or $40, depending on the river. And non-BC residents can’t fish for steelhead on weekends on those rivers where the daily surcharge is required. perhaps some of those foreign commercial vessels were allowed? fish in the exclusive fishery zone. Thanks for your note Glenn. Yes. Some (Koreans) were. Their operations were stoppen and the parliamentarian that brokered the deal was held accountable. The issue at hand is not about penalties but to ensure due process is adhered to. There are organised efforts to avert Bahamian law and bypass local operators. If a penalty is light the offender may just say it is a part of the cost of doing business. If it is steep, then the penalty will become a budget line item that cannot be ignored. There are thousands of cruises to The Bahamas where fishing (catch and release and consumption) occurs. It is unrealistic to police the entire territory – so it seldom happens that tourists and locals are aprehended and charged. Just keep in mind to obey the law as best possible. Do not knowingly disregard a country’s sovereignty and all will be well.